I really wanted to find a Best Sunday Roast in London. I have visited The Swan at The Globe previously for dinner so thought we’d give it a go for a Sunday roast. By using their online form, booking was a simple affair. Upon entering and walking up some stairs, we entered the bar area and were greeted to be shown to our table in the restaurant. 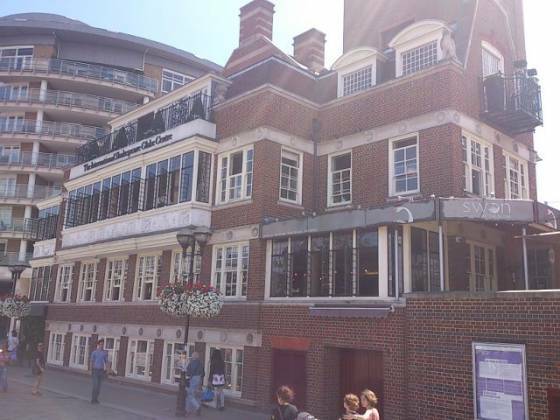 This was on the second floor; on the right the restaurant area, on the left a relaxing / reclining area with a stairwell into the Globe Theatre. The doors for the toilets were also in this area. We were shown to our tables and given the obligatory menus. 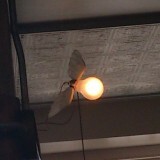 The restaurant was fresh and bright with lots of funky twists, such as the lights being bulbs on wires which had small (swan) wings on them – I believe they were meant to give the impression they were flying. There was a Greek style column, old fashion windows, and an open kitchen too… I had very high expectations of The Swan at The Globe, and I didn’t think I was going to be disappointed. After choosing drinks (Claire had a diet coke, I asked for a pint of Hoegarden), we then chose our meals. 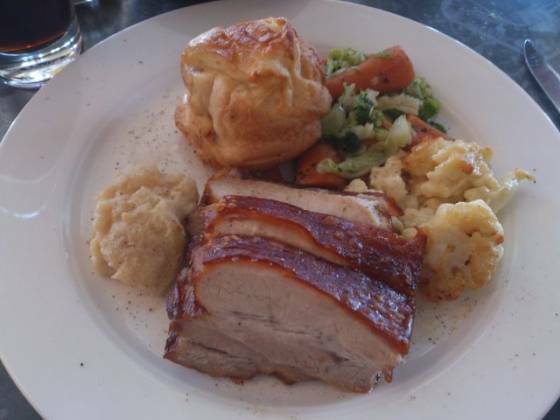 3 roast meats were on the menu, Half a Roast Chicken, Roast Pork Belly or Roast Beef. Claire decided on the pork, I went for the beef. About 15 minutes or so later, our meals were brought out. They looked fantastic! 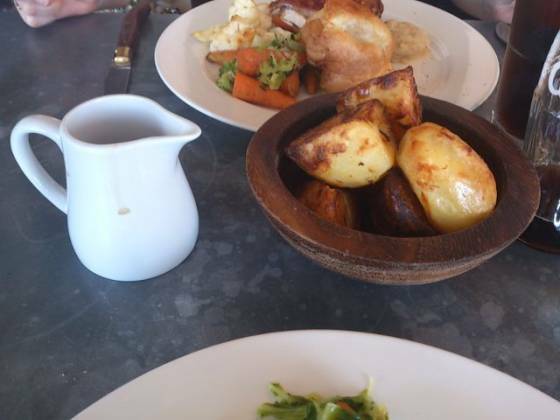 We each had our meat, yorkshire pudding, vegetables, with the roast potatoes in their own bowl with a jug of gravy separately too. And what’s this? Cauliflower Cheese? 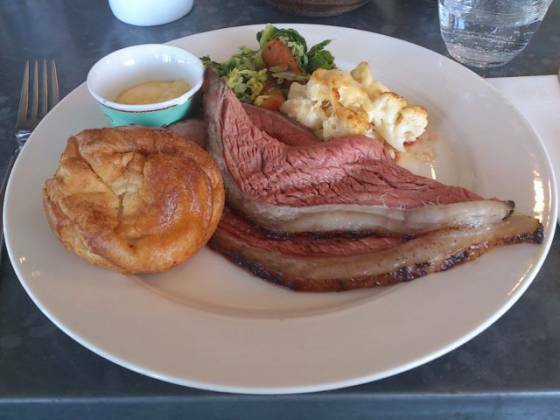 My roast beef was served medium rare, pink and tender – and huge thick slabs of meat. Claire was very pleased with her pork belly, being succulent and not overly fatty – again, large slabs of meat. Also, the apple sauce (in its own pot) seemed home-made, with large chucks of apple. I was served horseradish on the side as well. The roast potatoes were cooked to perfection – seasoned, crispy on the outside and fluffy inside. The Yorkshire pudding was fluffy, it did taste a bit of oil, but was good. I felt The Swan at The Globe served a nice selection of vegetables, being shredded cabbage, carrots and cauliflower cheese. All were cooked properly and complimented the meal rather than taking over from it. If I am being picky, I would have liked more cauliflower cheese (because I am greedy), and perhaps being a bit more burnt on top. The gravy was quite thin, but it was enough for the both of us. All the while we were feasting on our meal, the waitress was topping up our water etc… After our meal, I did have a quick look at the dessert menu – I had to wait until seeing the other tables desserts as they all sounded good… I decided on the Chocolate Profiteroles as Claire could share (if I let her, that is!). 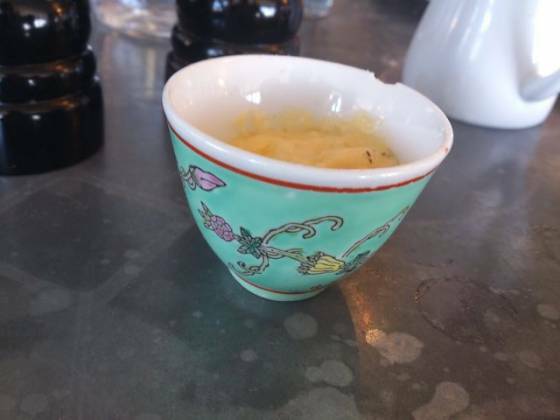 I also asked for an espresso. They didn’t take long to come out. 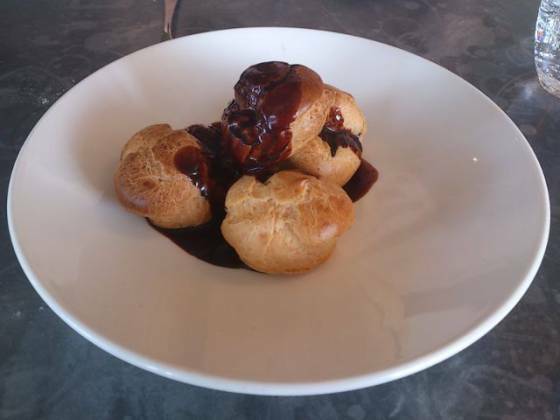 It looked tasty; with 4-5 profiteroles I “let” Claire have one… Very nice indeed, with chocolate sauce and cream on the inside. 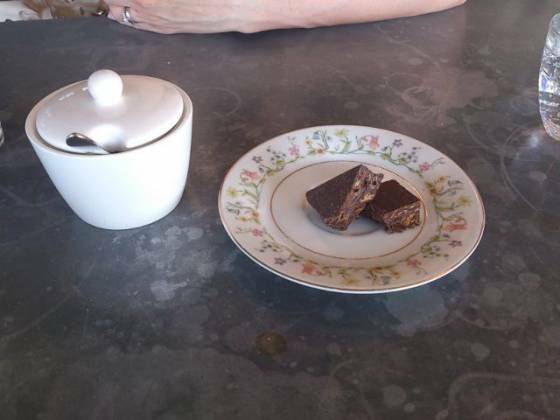 The espresso was nice, we were served a chunk of chocolate each too. The Swan at The Globe was a fantastic Sunday lunch. The service was impeccable, consistently making sure we were looked after from the moment we arrived. The venue was interesting, and the view amazing! Our meal was top-notch with excellent quality meat. My dessert was good too… They also had some nice little touches, such as the chunks of chocolate and the quaint pots for the apple sauce and vintage tea set / saucers. It’s hard to find any fault with them. Even the bill, £14-£16 for a main course may not be everyone’s price range, but this was in Central London, right on the river… You’d expect tourist trap pricing with tourist trap food but, not the case. I would almost call this a good value Sunday lunch! The Swan at The Globe get a well deserved Top Rated!